A cricket video for Cricket World TV about the latest cricket news from http://www.cricketworld.com. Find us on Facebook: http://www.facebook.com/cricketworld and Twitter: http://www.twitter.com/cricket_world as we look back at the latest game in the Indian Premier League - IPL 2012 - IPL 5 - between Kings XI Punjab and Royal Challengers Bangalore. Chris Gayle hit 87 in 56 balls and AB de Villiers 52 in 39 and the pair put on 131 together - a record for this tournament - as the Bangalore side recovered from being reduced to 25 for three early on to claim a five-wicket win. 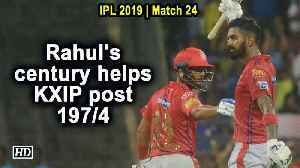 Azhar Mahmood, David Hussey and Shaun Marsh had earlier battled hard to get Kings XI to a competitive score but their efforts proved to be in vain as they were beaten with three balls to spare. The 12th edition of the cash-rich Indian Premier League couldn't have hoped for a better start as defending champions Chennai Super Kings are all set to take on the star-studded Royal Challengers..